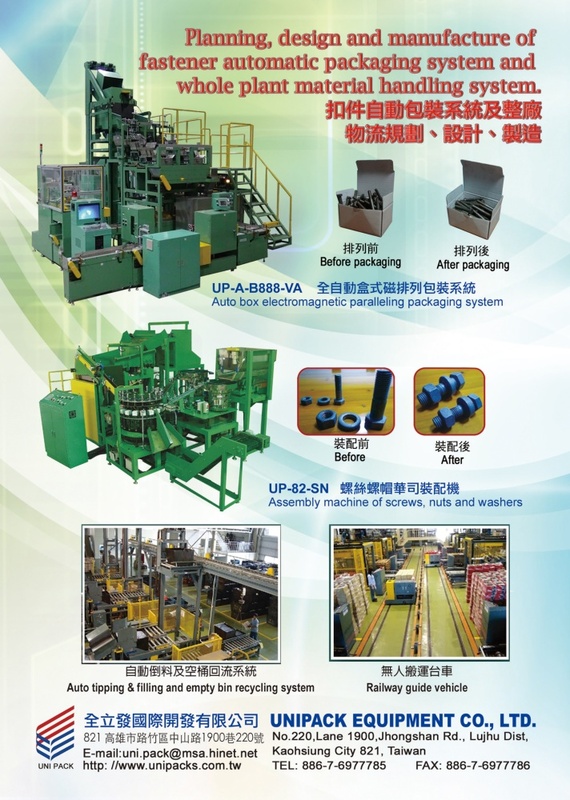 With over twenty years experience UNIPACK EQUIPMENT CO., LTD is one of leading manufacture of fastener packaging machine in Taiwan. Our product, auto carton forming machine, auto box forming machine, auto carton bagging machine, auto electromagnetic paralleling / filling packaging machine, auto carton folding & sealing machine, auto strapping machine, computer control printing/labeling machine, auto carton palletizing machine, auto wrapping machine, auto packaging system, auto conveying system, warehouse system, and whole plant conveying system planning, design, and manufacture. Machine integrated with the exclusive and patented feature and applied with the PLC control and Human Machine Interface, the integration making them more humanized. Our main product, “Auto electromagnetic paralleling packaging machine” apply the magnetic mechanism making the long screw oriented automatically. Use the packaging machine auto weighting, paralleling instead of manual oriented packing to increase the packing efficiency and quality, and build up the Corporate image and product value.